Gaudi's Park Güell in Barcelona is a large complex of beautiful artistic designs, architecture, green space, and great views of the city. With Gaudi's fame comes the crowds, and with the crowds come the souvenir touts. As much as Park Güell is worth visiting for the architecture, staying for the free entertainment from the touts is almost worth the trip to the outskirts of the city itself. One of the most annoying things about popular tourist destinations to us is the always present souvenir tout trying to sell you something you do not need. In a seemingly endless supply of touts, you will see more trinkets than you would care for in an otherwise beautiful park. Selling these is illegal in most cities, but the police tend to do little about this other than making sure they continue to move away rather than making larger busts. To get around this, most of the sales "stalls" are nothing more than a blanket or knitted compartment that can be mobilized or demobilized in just a few seconds. 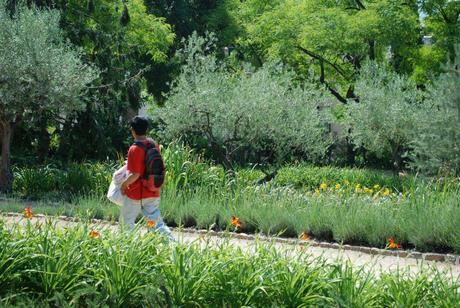 As the crowds come in, Park Güell becomes home to one of the world's largest games of cat and mouse. The cat? The lone security guard that continually patrols the park. The mouse? The dozens of souvenir touts. A whistle goes off and the game begins. After the whistle, the touts pack up and run away scared. Nearly a half dozen sellers pack up their belongings and run off to the far corners of the park, leering back to see if our hero is on their tail. A few minutes later, the patrol slowly comes around the corner, not chasing the touts out of the park but rather pushing them off to new corners of the grounds. 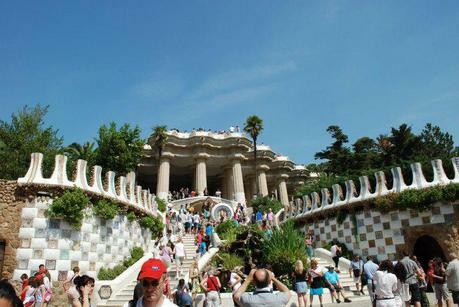 But with its size comes its flaw, Park Güell has many nooks for the touts to run to and setup again for more unsuspecting tourists while remaining undetected for quite some time. The game continues. As we enjoyed Park Güell, this game of cat and mouse played itself out countless times over the course of our visit. Every so often we'd enter a new corner of the park only to be greeted with a dozen new touts running away only to find our hero strolling along shortly thereafter. In many of these occasions the touts would just hide one level below where the patrol cop was at and be anxiously awaiting to see if he would wander around the corner to either run away or setup again for future sales. While we were appreciating all the park has to offer, we thought this entertainment was almost more enjoyable than the impressive works of Gaudi. 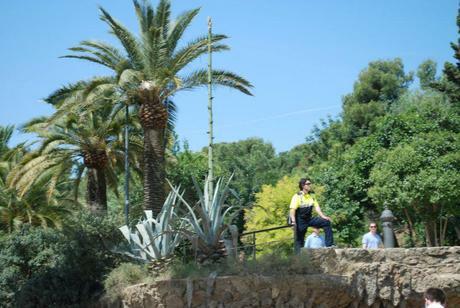 When paying attention to it, we noticed that the tout network at Park Güell is so vast that they employ lookouts that do not sell trinkets and are purely there to be one step ahead of the cop and to alert the sellers when the patrol approaches. The network is vast, and the question on the profitability comes into play when you consider the dozens upon dozens of sellers and associates in one small area over the course of a day, week, or month. The game goes on, and until souvenir touts are completely banned from all tourist sites, the game will continue until the future. 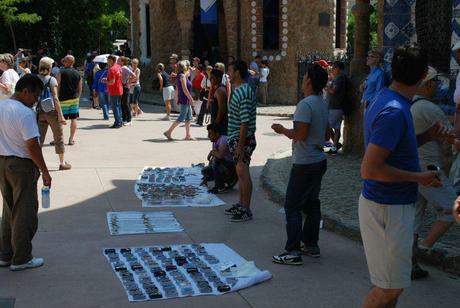 But if you do want to have a bit of fun, bring a whistle to Park Güell and see how many touts you can disperse with one puff. Let the games begin! Today's post was brought to you in part by our friends at Aqua Waikiki Wave, the new boutique hotel located right on the beautiful shores of Hawaii's Waikiki Beach.